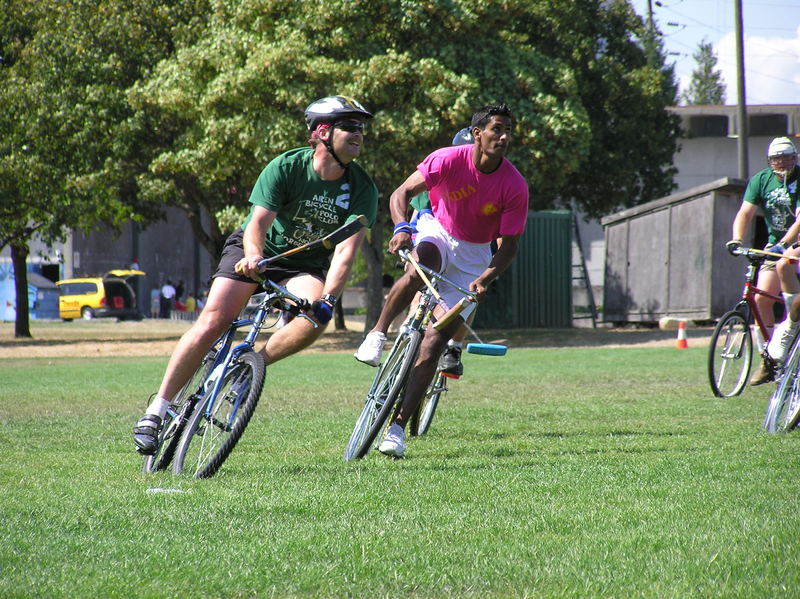 The United States won its first World Bicycle Polo Championship August 3-7 in Vancouver, B.C., Canada, defeating France (7-4), India (12-8), California (16-2), and Canada (4-2). France took the silver medal with wins over Canada (6-4), California (19-0), and India (6-3). India earned the bronze with victories over Canada (13-8) and California (26-1). Play began August 3 with a match between the two countries that, between them, had won all six of the previous world championships: Canada and India. India had won the first four tournaments and taken the bronze in 2002, but opted to skip last year's event. Canada had taken the title in 2002 and 2003, and hoped to defend with all five of their players returning. India showed that they were loaded for bear by running up a 6-0 lead in the second chukker on their way to a 13-8 victory. New team member Sohan Lal showed that he would be a force to be reckoned with by outscoring the entire Canadian team with nine goals. Geoff Nielsen led Canada with five. The Indians, apparently not satisfied with a 5-goal margin of victory, filed a protest to negate Canada's eighth goal, which was scored just after an umpire inadvertently blew his whistle. For pictures, click here. August 4 saw two games played, with the first matching the silver and bronze medalists from 2003: the U.S. and France. The U.S. took a 2-0 lead in the first chukker and raised their advantage to 6-1 at the half. Each team scored one goal in the third period, and France added two more in the fourth to make the final score 7-4. Bill Matheson led the scoring for the U.S. with three goals, while Jon Smalley and Brennan McQuerry each added two. Jean-Michael Languille and Didier Derly each tallied two for France. For pictures, click here. The second game was India's 26-1 rout of California, with Sohan Lal again leading the way with ten goals. Pramod Tiwari added six, Milind Patle and Prabhu Dayal three apiece, and Deepak Kumar and Shrikant Sakarkar two each. Alain Derly scored the lone goal for California. For pictures, click here. Play began August 5 with a meeting between the 2002 gold and silver medalists: Canada and France. France had never beaten Canada, though the two had played to a 7-7 draw in 2002. Canada got off to another slow start, trailing 3-0 after the first chukker just as they had against India. Each team scored once in the second and third periods, and Canada pulled within one in the fourth on Geoff Nielsen's third and fourth goals of the day. Stephane Malandain scored the insurance goal for France, making the final tally 6-4. Stephane Paris and Didier Derly each tallied two for France, with Malandain and Jean-Michael Languille adding one apiece. For pictures, click here. The next match featured India and the U.S., with the latter taking a 3-1 lead in the first chukker on three goals by Matheson to one by Primod Tawari. India tied the score 5-5 at the half on five goals by Sohan Lal, while the U.S. got single goals from Brennan McQuerry and Jerry Tagestad. The U.S. took a 9-5 lead in the third period on two goals by Tagestad and one apiece from Brennan McQuerry and Jon Smalley. India got within 10-8 in the fourth, but when the U.S. was awarded a penalty in the mouth of their goal, two Indian players were ejected for arguing the call, leaving them shorthanded for the rest of the game. Another Indian player was ejected for dangerous play when the U.S. lead was 12-8, and the game was declared a forfeit. For pictures, click here. The third game of the day was Canada's 16-2 win over California, with Mike Boyd and Harvey Barton leading Canada with four apiece, Mark Devlin adding three, Peter Furmedge and Geoff Nielsen two apiece, and Asoka Mendis one. Ernie Sanchez scored both goals for California. For pictures, click here. August 6, the penultimate day of the event, saw four contests held. The first, played in a driving rainstorm, featured the two U.S. teams, with California coming out on the short end of another 16-2 score. Dennis Mullen led the winners with seven goals, with Brennan McQuerry adding five, Dennis McQuerry two, and Tagestad and Matheson one apiece. Jerry Gradisher and Kurt Maverick each tallied one for California. For pictures, click here. A delegation from Pakistan had arrived on the afternoon of August 5, so games were added to the schedule for August 6 and 7 to give them a chance to play. First up was Canada, who were not originally scheduled to play on August 6, and thus had to play without Peter Furmedge and Mike Boyd. Four Indian players who were not on the Indian roster, but who had nonetheless undertaken a trip halfway around the world, filled out the "Pakistani" lineup with Abdul Razzaq and Zubair Anwar. "Pakistan" won the game 10-9, with Anwar scoring one goal and Indian players adding the other nine. Asoka Mendis led Canada with four, while Harvey Barton added three and Geoff Nielsen and Mark Devlin one apiece. For pictures, click here. The final two games of the day were among the most lopsided in the tournament, with France defeating California 19-0 and India routing "Pakistan" 15-1, a remarkable reversal of "Pakistan"'s form from their earlier victory over Canada. Jean-Michael Languille led France with five goals, with Didier Derly adding four, Julien Lassere and Stephane Malandain three apiece, and Stephane Paris and Jean-Pierre Malandain two each. For pictures, click here. Sohan Lal was again India's high scorer with seven goals, whle Deepak Kumar tallied three, Pramod Tiwari and Milind Patle two apiece, and Shrikant Sakarkar one. For pictures, click here. In an effort to give the "Pakistan" team a chance to play every other team, five games were scheduled for August 7, but with the banquet scheduled for 6:00 it was going to be a difficult task. Play began with California taking on "Pakistan," with the latter coming out on top 8-4. Indian players scored all eight goals for "Pakistan," while Ernie Sanchez led California with two, and David Talalayevsky and Kurt Maverick each added one. The second game was for the silver medal, with India facing France, the only team ever to defeat them in international competition prior to this year (an 11-4 victory in Paris in 2002). To say the game was hard-fought would be an understatement. The first chukker was scoreless, and India took a 3-1 lead in the second. Jean-Pierre Malandain entered the game for France in the third chukker, and tied the score with a pair of goals. Stephane Paris and Pramod Tiwari were ejected from the game for rough play, and the remainder of the chukker was played 3-on-3. The teams added substitiutes for the fourth chukker, and France took the lead on goals by Languille, Jean-Pierre Malandain, and Stephane Malandain. Things got ugly again as Languille was injured on a foul, and when he retired from the game he took Sohan Lal with him under the provisions of Penalty 8. The teams played the remainder of the game 3-on-3, with the final score 6-3 for France. For pictures, click here. In contrast with the France-India game, the match between the U.S. and Canada was a fast, clean game with very few fouls (and very few goals). Another scoreless first chukker was followed by a second in which Brennan McQuerry scored a couple of goals for the U.S. Geoff Nielsen scored the only goal of the third, and Asoka Mendis tied it up for Canada early in the fourth. Bill Matheson scored what proved to be the game-winner for the U.S., then provided some insurance by converting a penalty shot to make the final score 4-2. The final match of the tournament pitted France against "Pakistan," with neither of the actual Pakistanis playing so much as a single chukker. The first chukker ended with the score tied 1-1, and things got really interesting in the second. Jean-Pierre Malandain took a pass from Jean-Michael Languille to give France a 2-1 lead, but the Indian players claimed that a French player had hit the ball four times. Neither umpire had seen such an infraction, so they asked the Indian referee if he had. He said he had not, but that the only fair thing was to negate the goal and have a bowl-in at the 45-meter line. Why he thought it fair to negate a goal that was scored without violating the rules, and before which no whistle was blown, he would not (or could not) say. When the umpires decided to follow his unusual advice, the French refused to play, and the "Pakistani" team went down the field 4-on-0 to score. There ensued a 40-minute argument in which both teams threatened to quit if the other's goal was allowed to stand, and the referee threatened to sue if his diktat was not followed. The game was resumed with "Pakistan" leading 2-1, and it ended in a 6-6 tie well past the appointed dinner hour. Mercifully, the game between the U.S. and "Pakistan" was cancelled.